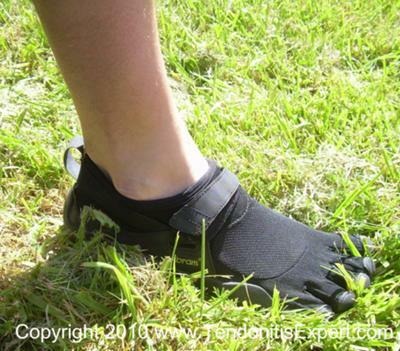 I wore my Vibram Fivefingers KSO barefoot shoes all day today. Around the house, during a 1.5 hour massage, and then I walked to a long grassy strip/mini-park and did 300 lunges in sets of 20. I wanted to test out the lunge action on my feet and how it would work with the shoe. Plus, I want to get my feet into barefoot shape. So. 300 lunges with just my bodyweight (and my car keys). On slightly uneven ground and grass. The moving step/landing in the KSO's worked just fine for me. There was no slipping, no sliding, either of the shoe on the ground or my foot in the shoe. It really does feel barefoot! I can feel the roughness of the grass give way to my foot, I could even feel the grass pushing up between my toes!. I could feel details of the ground under every different inch of my feet, and I notice my nervous system really is involved at a more minute level, actually being able to feel all the details of my foot interacting with the variable ground and having to adapt to it. This was interesting to me. It's not that the body suddenly HAS to adapt to the ground, it's that it finally GETS to. FINALLY it can feel all those details that regular shoes blind it to. I quit at 300 lunges, it felt like it was a good time, as I could feel my interior feet straining and I want to break them in just right. It's DEFINITELY a retraining of the feet, and the whole nervous system. 1. The nervous system LOVES more input. Now that my foot and toes can feel, they can finally do what they are suppose to do, on a variety of levels including all the millions of tiny little corrections/movements to keep balance and incorporate ALL the system. 2. Regular shoes have really dumbed down my feet and my nervous system. 3. I've known for years that my arches are flattening out. That's why my left foot is at least half a size bigger than my right. I wonder if that's happened because my toes don't really need to work much in regular shoes so structures that are supposed to support the arch have atrophied or just not worked for so long that my arch has lost their support. As I walk (and do lunges), this makes a lot of sense. Feeling my toes work, and work independently of each other, and how that makes my foot and lower leg work newly/differently, it's like it's the first time I have really walked barefoot. (Not since I was a toddler, probably, have I run or walked around outdoor without 'shoes'. Please reply using the comment link below if you have anything interesting to share.